Is Bachmann picking up a lot of support from Republican women as Hillary Clinton began too as the nomination race went on in 2008? You are discouting the fact that Wisconsin is next to Minnesota, which accounts for Bachmann's showing. She was at 9% in your North Carolina poll. Bachmann and Pawlenty both polled well here in March. 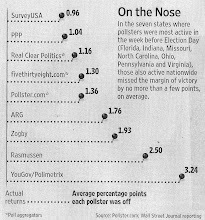 I think it will be interesting to see what Romney's best states are after New Hampshire. He is in danger of becoming McCain in 2000 to Perry's Bush. Winning New Hampshire alone does not a nominee make. "You are discouting the fact that Wisconsin is next to Minnesota, which accounts for Bachmann's showing." No, that's not it. Romney's also from Michigan, which is next door. And as you pointed out, Pawlenty did well before dropping. This Perry-Bachmann-Romney trifecta is what we're seeing in all our polls in the last couple weeks. "Is Bachmann picking up a lot of support from Republican women as Hillary Clinton began too as the nomination race went on in 2008?" No. As you'll notice in the crosstabs, she actually leads among men but is only 2nd or 3rd with women. We've seen a similar trend for Palin in the past. Now that would be a dream Republican primary for Democrats. Recycled Palin versus Recycled Dubya versus Recycled McCain. Wisconsin is usually a later state to vote in the primary process so after the early states go things will look much different.